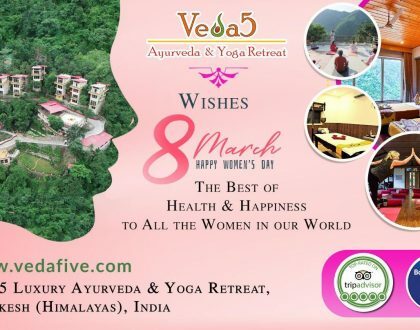 The 3 days of Digital Detox at Veda5 Luxury Retreat in Rishikesh (Himalayas), India welcomes people from around the world to swap the typing with Ayurveda, the scrolling with Yoga and the calls with Meditation in a paradise hideaway where luxurious seclusion meets exotic natural beauty. 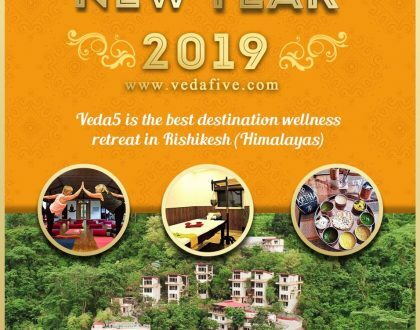 Nestled in the foothills of the Himalayas, Veda5 is surrounded by scenic views and trails, goodness of lush greens, refreshing mountain air and c lean waters to nourish the overall well-being. Since thousands of years in India, Ayurveda and Yoga have been carefully developed with invaluable scientific treasures of the ages and wisdom of the sages to promote health, happiness, creative growth and eternal youth. With Veda5’s highly-experienced Ayurveda doctors and therapists, Yoga instructors and our overall staff, this retreat is a tremendous opportunity to experience the timeless sciences and practices to restore balance, preserve youth and gain real vitality at any age. The diverse mix of Veda5 guests include those who’ve never experienced Ayurveda and Yoga to those who’ve years of deep experiences and this creates a very positive environment to make new bonds and to strengthen old bonds as people of various backgrounds and perspectives connect and share with each other. Veda5 is architecturally well-designed with natural and healthy living in mind and is well-appointed with modern amenities in the clinic, spa, yoga hall, rooms and other areas to meet and exceed the standards of a luxury destination. 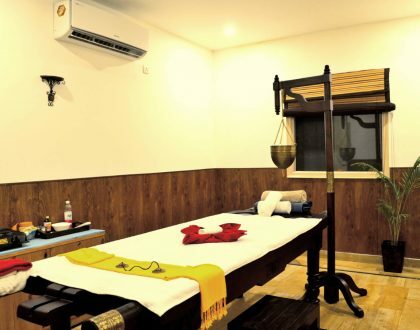 The cosy, airy and natural well-designed facilities with picturesque views will make your Ayurveda, Yoga and overall wellness experience a beautiful, nourishing and memorable one. According to Ayurveda, our human physiology is a reflection of the laws of the universe, and the more in tune our lives are with nature, the healthier we are likely to be! Our bodies possess the natural intelligence to process the foods that are closest to nature, such as fresh whole grains and organically-grown fruits and vegetables. At Veda5, our guests enjoy delicious and healthy food with fresh produce including from our organic farm amidst scenic views, lush greenery, fresh air, clean water and the serenity of the Himalayas. Veda5 Ayurveda & Yoga Retreat is 45 minutes drive from Dehradun Airport (DED). Dehradun Airport is 50 minutes flight from New Delhi Airport. There are 15 daily flights from New Delhi to Dehradun. This retreat will facilitate breakthrough improvements in your physical, mental and spiritual well-being. You will go back home rejuvenated & energized! Do see our photos and videos on our website!